In all my years of bread baking I’ve never had much luck with rye. The grain has less gluten than wheat, which makes rye flour very dense, without the elasticity that makes breads rise well. Most rye bread recipes call for a lot of yeast, a mixture of white and rye flours, and very long rising. Even so, the rye loaves I’ve made have been either leaden in texture or so mildly rye flavored that they hardly deserve the name. But I keep hoping, because I do like rye bread. 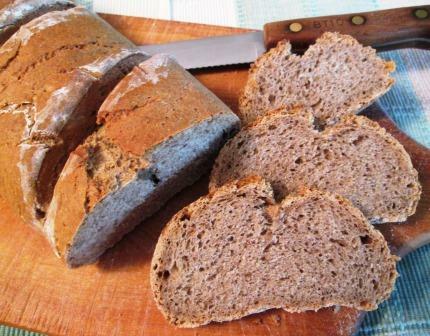 For my latest attempt, I tried a recipe from Baking with Julia called Eastern European Rye. It has the three characteristics mentioned above: a whopping 2¼ teaspoons of yeast for only 3 cups of flour; equal parts rye and regular bread flour; two risings in the bowl and one as a loaf. But it also has some new-to-me features. 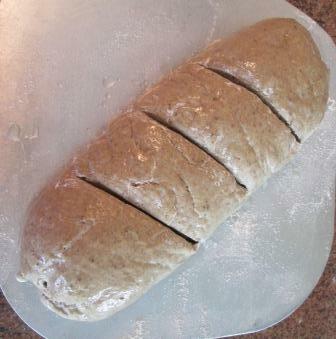 First, ¾ tablespoon of finely ground caraway seeds were to be mixed right into the dough. This was a challenge. I had only whole seeds, which were stubbornly reluctant to grind. A mortar and pestle did nothing at all to them. The mini-food processor only broke them up a bit. 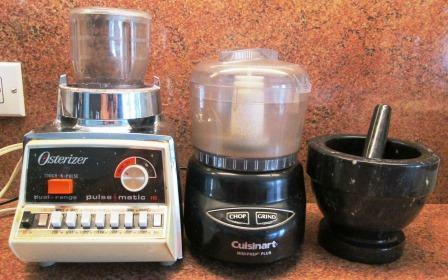 Finally I dug out my ancient blender and spun the seeds around in its mini-cup for a long time at the “liquefy” speed. I wouldn’t call the result “finely ground,” but it was what I could achieve, so I went with it. Here are the three strugglers. OK, on with the show. 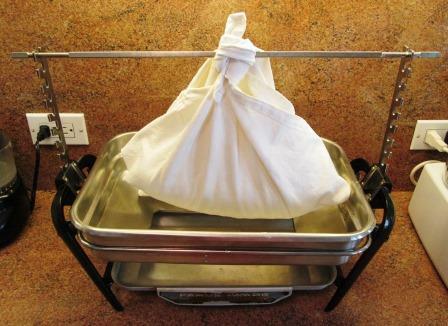 Once mixed, the dough had to be kneaded twice as long as usual in the Kitchen-Aid with the dough hook. Then it had to be transferred to a big bowl that was painted with melted butter – not something I’d ever heard of. Even the plastic wrap to cover the bowl had to be painted with butter. Given the modest size of my ball of dough, I thought that was unnecessary caution, but the dough rose surprisingly high, both times. This was the liveliest rye dough I’ve ever worked with, and I began to have hopes. Shaping the loaf was promising too. The dough was supple but not sticky and very easy to work with. The shaping instructions were quite elaborate – designed to produce a big cylindrical loaf with well-rounded ends. In this ridiculous hammock, the loaf was to rise for only 30 minutes. I doubted it would do much in that little time, but when I unwrapped the sling it had grown into a good-sized blimp. Another good sign, and yet more hope. I tilted the loaf onto a pizza peel, gave it three deep horizontal slashes, painted it with an eggwhite glaze, and slid it onto a baking stone in a 425° oven. That was when nemesis struck. The bread hardly rose at all in the baking – even with ice cubes thrown into the oven to provide steam and keep the surface soft enough to swell. The slashes had grudgingly opened a bit, but no interior dough came up to fill those deep ravines. My loaf came out of the oven virtually the same size as it had gone in. And there was that cloven hoof at one end, where the dough had broken open in a place that it shouldn’t have. (BTW, those blotchy white areas are where I’d missed applying the glaze. The difference wasn’t so visible when the bread was raw.) The loaf felt heavy enough to use as a club. The crust was extremely hard. Did I do something wrong? If so I can’t think what. I was deeply disappointed. But, oddly enough, when the bread was sliced . . .
. . . it tasted very good. Pretty it wasn’t: The longish, flat slices were rugged and chewy. But they had robust rye flavor and a little tang of the caraway, which sang on the palate. We could eat this sturdy, homely bread. And Tom reports that it makes good, if minute, sandwiches. So while it wasn’t the ideal rye bread of my dreams, it’s one of the better ones I’ve made. I’ll probably try the recipe again one day. Maybe if I shape the loaf into a shorter and fatter cylinder, I’ll get a better rise. Maybe if I make the slashes shallower and widen them a bit before putting the loaf in the oven, they’ll get the idea to open in the heat. Maybe more ice cubes for more steam. Hope springs eternal! I tried two new recipes for a casual dinner this week. One came out very well; one didn’t. Fortunately, the main dish was the good one. I had a nice pair of Berkshire pork chops that I wanted to do something interesting with. 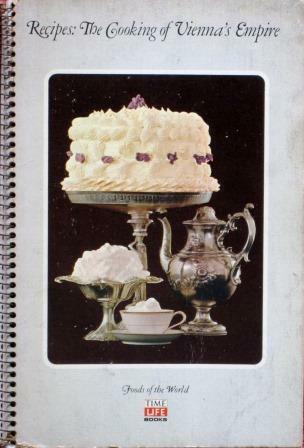 I chose a recipe from The Cooking of Vienna’s Empire volume of the Time-Life Foods of the World series. This 45-year-old pioneering series of cookbooks rarely lets me down and often points me in directions that I wouldn’t have thought of on my own. In this case, its recipe called for classic Hungarian flavors: lard, sweet paprika, onions, tomato, and sour cream. It was an opportunity to use some of the paprika I bought at the wonderful Great Market Hall in Budapest, on a vacation quite a few years ago. To my continuing surprise, it still hasn’t lost its strength. Given how well it worked in this recipe, I think I should use it more often. So I browned the chops in lard (actually in their own fat, trimmed off and rendered out); removed them; softened chopped onion and garlic in the same pan; added paprika, chicken broth, and tomato puree; returned the chops and simmered them very gently for 40 minutes. When they were done I kept them warm while I made the sauce. I stirred sour cream mixed with a bit of flour into the pan, cooked that briefly, then finished the sauce with julienne strips of boiled ham and my own bread-and-butter pickles. Actually, the pickles should have been sour gherkins, but I didn’t have any on hand. I had intended to use cornichons, but then I discovered that I didn’t have any more of those in the fridge – so bread-and-butter pickles it had to be. Altogether, it made a very tasty dish. 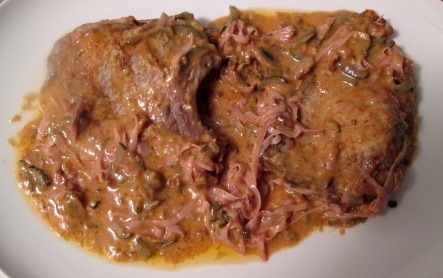 I’d worried that the ham and pickles might be too insistent in the mixture, but they blended right in, providing a nice textural contrast to the tender pork and the rich, creamy sauce. My pickles aren’t as sweet as most b&b’s are, which undoubtedly helped. The accompanying vegetable for the chops wasn’t so successful. I rarely cook fresh corn off the cob. I just don’t think of it, probably because when I was growing up, any corn off the cob that my family ate came out of a can. But it’s high corn season now, so I thought I’d try something with fresh kernels. Starting small, I chose a brief recipe for sautéed corn from America’s Cook Book, a 75-year-old volume that was my mother’s only cookbook. It said to sauté cut corn in “fat” (I used butter) for 5 or 6 minutes until “delicately browned.” Well, my corn started looking dry before really browning, so I didn’t persist but went on to the only other step, which was stirring in salt, pepper, and some heavy cream. I thought the dish might come out like creamed corn, but no, not at all: My corn kernels instantly absorbed all the cream and pretended it was never there. 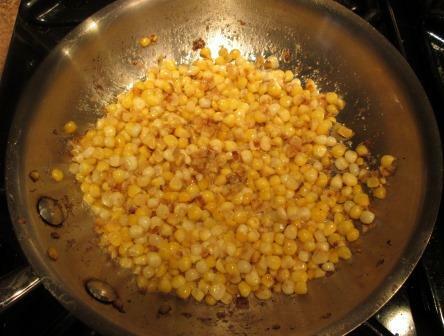 Unfortunately, despite its cream bath, the corn became rather leathery from the sautéeing. It had lost much of its freshness without gaining anything in exchange. We chewed our way through it, though, and consoled ourselves with our genuine enjoyment of the pork chops. There’s still enough of corn season left for me to try again with another recipe. Wildlife biologists have recently identified a whole new species of animal: the olinguito, a member of the raccoon family that lives in the cloud forests of the Andes. Although a carnivore, it apparently eats mostly figs. Reading about it, I couldn’t help thinking of another carnivore who also has a passion for figs: my husband. If Tom had been Adam, all that’d have been needed to assure humanity’s downfall was for the forbidden fruit to be a fig. In summer, if I let him, he could happily start five dinners a week with prosciutto and figs. I like figs too, though not as fervently as he does. Still, as a loving helpmeet, I try to keep him reasonably well supplied with his heart’s desires. Our most reliable source for figs is Sarah’s Fruit Stand, a family-owned sidewalk operation that is virtually a legend in the Village. Its fruits and vegetables are extremely varied and always excellent, and the prices are so low that you can’t help suspecting that they all must have fallen off a truck. 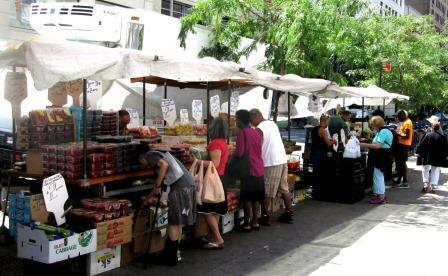 You never know what’s going to be there, unlike most of the sidewalk fruit stands, which all offer the same things – supplied, no doubt, by the same big wholesale vendors. 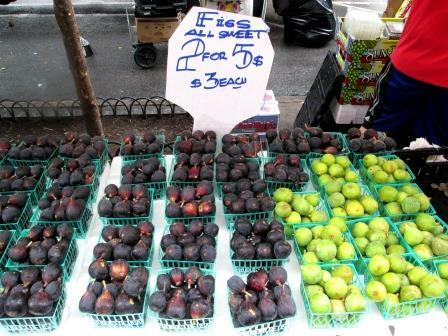 One of Sarah’s specials last week was figs: purple or green, $3 for a large box or two boxes for $5. Tom gravitated toward the black mission figs immediately and I urged him to take two boxes. Which he did, but that wasn’t really smart, since they were all ripe and would all need to be eaten at about the same time. So, over the course of the next three days he had some for breakfast, and we had some for dinner with prosciutto, and he had some more plain for dessert – and we were still left with two dozen bursting-ripe figs. Accordingly, I went hunting for a dish that I could make with them. Nothing in my own cookbooks captured my interest, but I liked a recipe for a Dalmatian fig tart from Croatia that I found on a website devoted to Eastern European food. Its name at home is Dalmatinska kolac od smokvi, and the recipe looked straightforward and tasty. 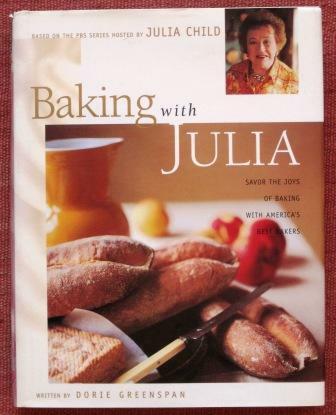 I had some very good pastry dough in the freezer – the extra from the pissaladière that I’d recently made from the Julia Child & More Company cookbook and written admiringly about here – so I defrosted and used that, lining an eight-inch tart pan with it and partially baking it. For the fig filling I warmed quarter-cup of heavy cream and dissolved a tablespoon of acacia honey in it. 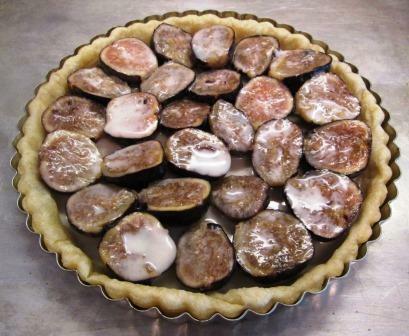 In a bowl I gently tossed 13 halved figs – that was my estimate of how many the tart shell would hold – with half of that mixture, so they’d start absorbing some of it. 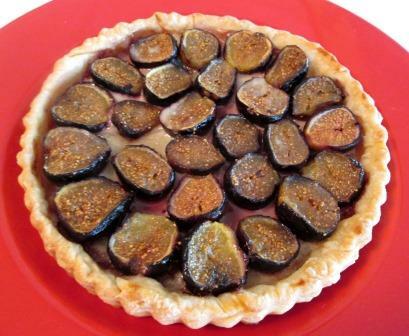 I arranged the figs in the tart shell and poured on the rest of the honeyed cream. It didn’t look very prepossessing, but I put it in a 375° oven and baked it until the juices were bubbling, and it came out much handsomer than it went in. The best news is that it was amazingly good, especially for so simple a preparation. Tom said it was delicious – still freshly figgy, but with added overtones from the cream, honey, and pastry, all of which worked together beautifully. What’s more, he said the leftovers were almost better the next day, eaten cold straight from the refrigerator. It seems now that we will never again have “leftover” figs in our house!